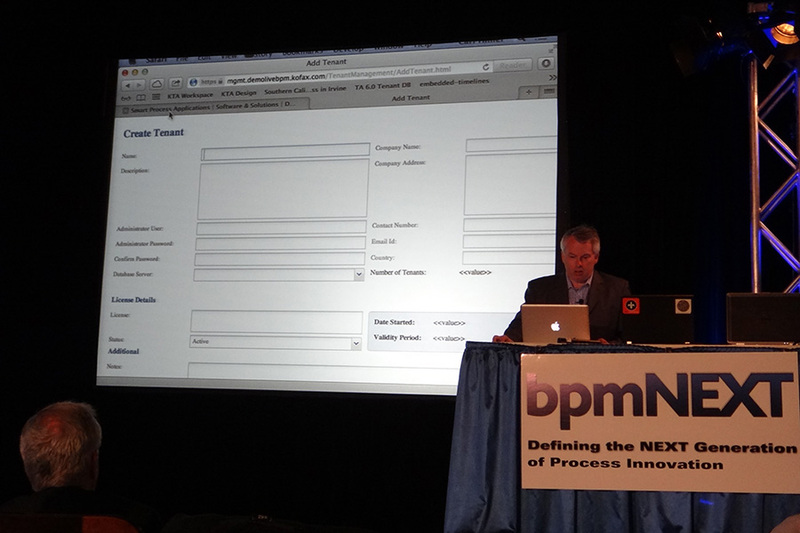 This story came into my mind at bpmNEXT conference because of its unique atmosphere: no marketing stuff, no lead generation, no speculations about what BPM is – nothing of what one may expect at a typical BPM event. Just a professional showcase of tomorrow’s BPM. As Bruce Silver (one of conference “fathers”, together with Nathaniel Palmer) said in the introductory speech, the most interesting moment of a BPM conference is when someone opens the laptop during a coffee break and says: “look at the cool stuff we’ve released to beta last week.” So we decided – Bruce continued – to throw away everything else and keep just this. 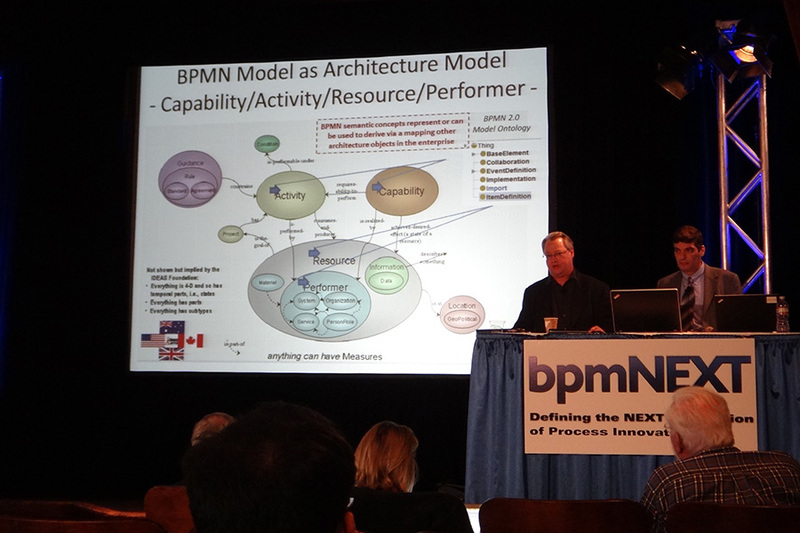 The plan was risky: why would BPM vendors share their latest ideas and achievements not even with public – with competitors?! Yet it worked, and worked great! BPM & Mobile, BPM & Social, BPM & ACM, BPM & things you weren’t even aware of – one could get it all in live demos followed by honest Q&A’s and backroom discussions. 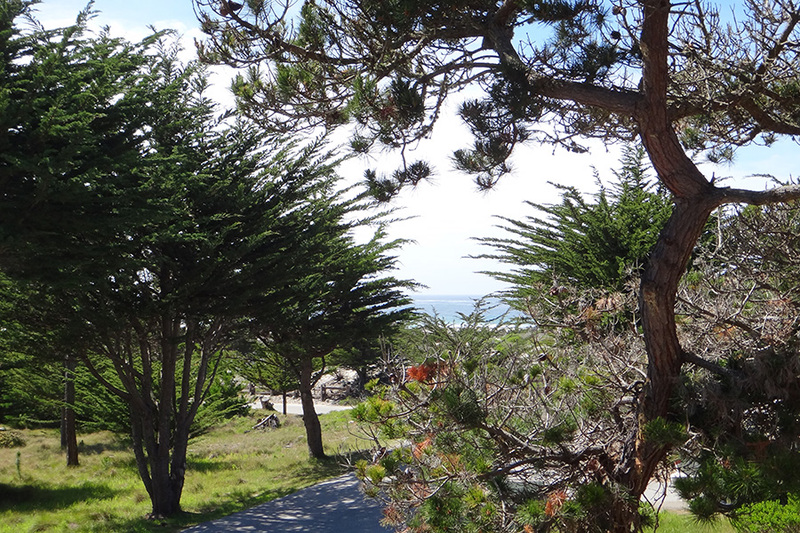 bpmNEXT is supposed to become an annual event with fixed venue in Asilomar at the Pacific coast near Monterey, CA. 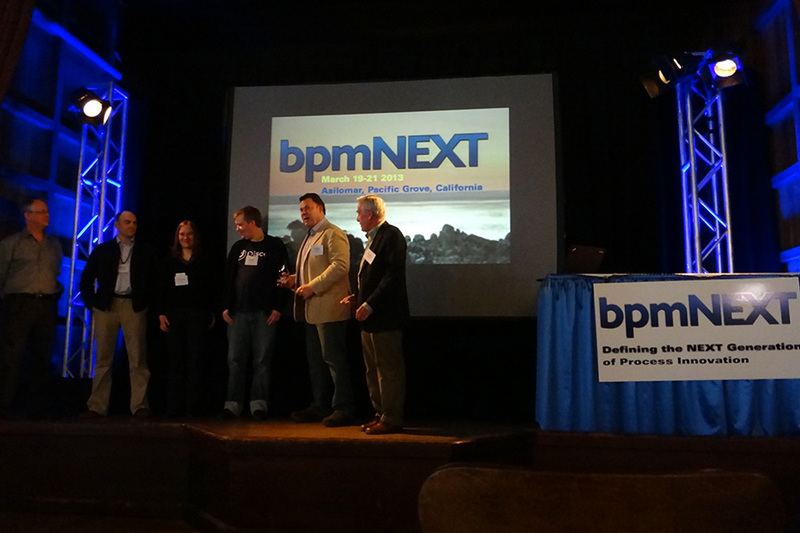 To make the analogy of the “Asilomar Score” complete, the bpmNEXT’2013 ended by “Best on Show” voting – just like wrestlers, BPM-ers decided who’s the best at the moment. Bruce Silver’s foreword was followed by the key presentation by Paul Harmon (BPTrends.com), probably the most influential practitioner and analyst in the industry. 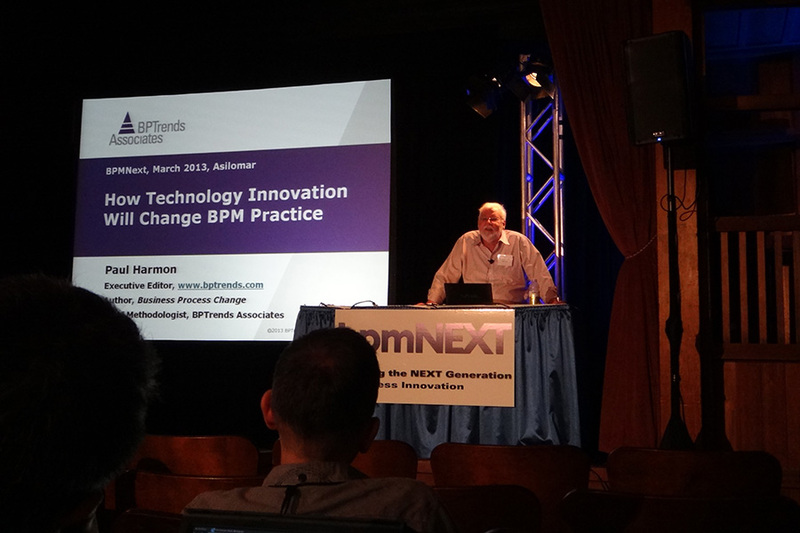 Paul Harmon raised the question that resonated in all participants: where BPM currently is in terms of the Technology Lifecycle, did it pass the Moore’s Chasm? 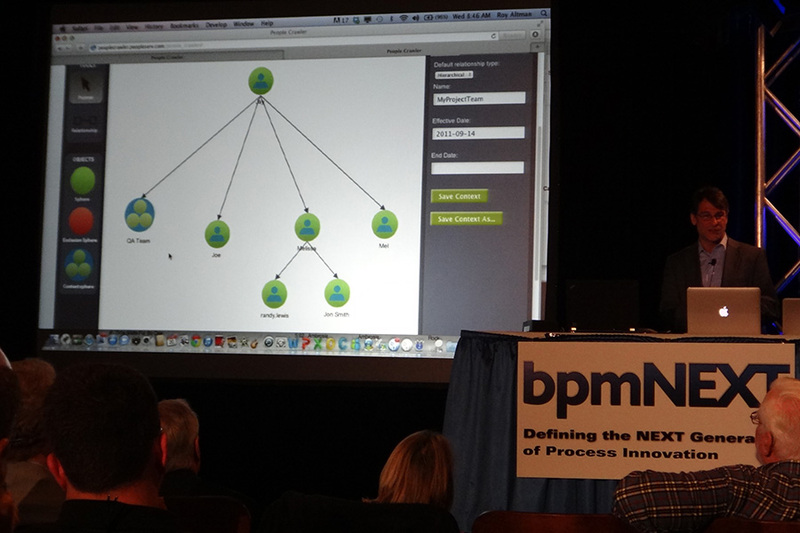 By Paul’s observation, there is a considerable growth of interest to BPM in the corporate world since the 2011 fall. 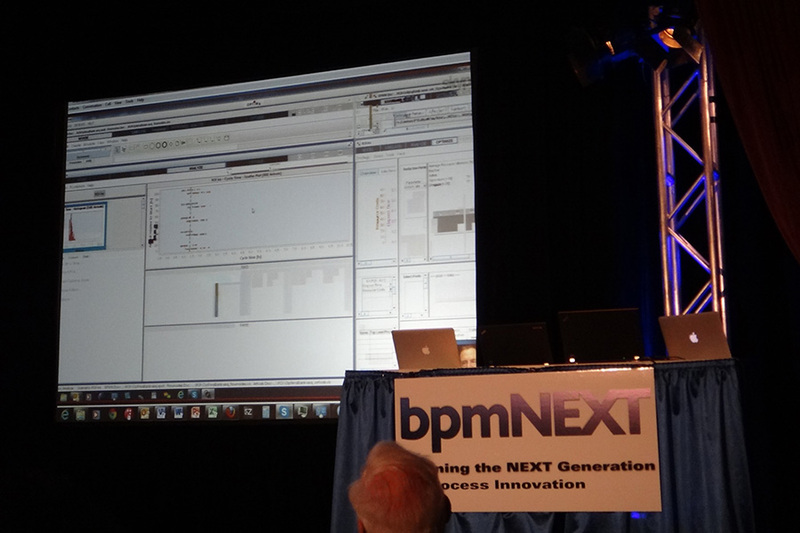 It’s pretty close to what we observe here in Russia – a strong raise of interest towards BPM since the end of 2011. 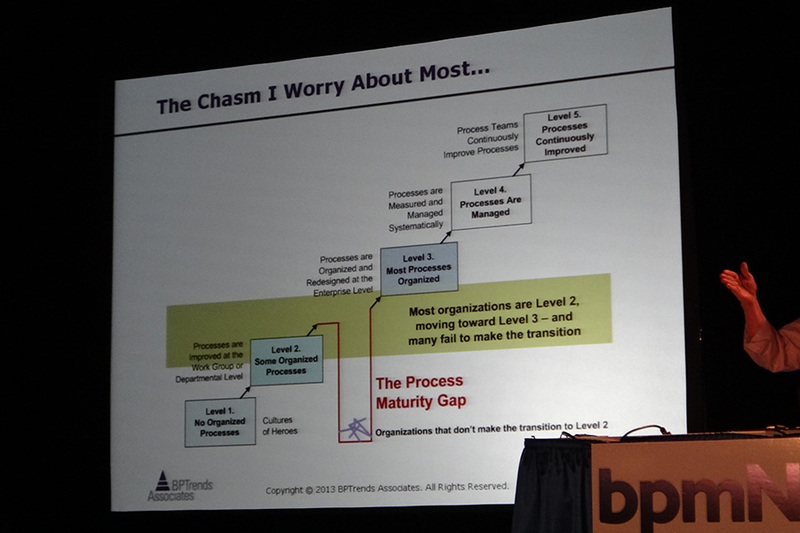 However BPM is still at the Early Adopters phase and didn’t cross the chasm yet. In simple words, it means that BPM today is safe enough for potential users but companies don’t consider it as a must-have like e.g. ERP. 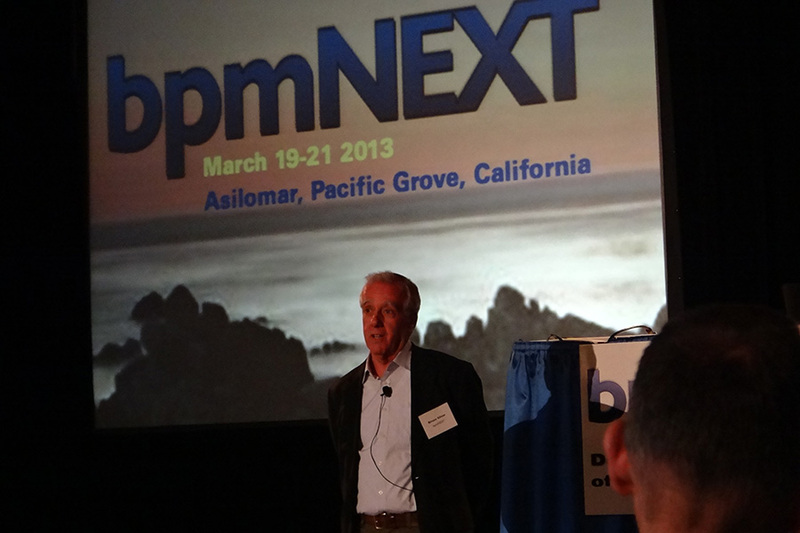 Paul predicted that BPM will cross the Chasm in next couple of years but didn’t argue it well I’m afraid. He wished to have two or three really great BPM success stories like e.g. a straight-through supply chain implemented in BPM – it’d help to break the barrier. Then Paul raised another question: what are the major stoppers? He shared his observation that there is a chasm at a single organization level: many organizations fail to progress from managing single processes to systematic control over processes enterprise-wide (from level 2 to level 3 on the BPM maturity scale). The possible reason is lack of BPM adoption at senior management level – it’s not on the agenda of most decision makers. During the discussion that followed we tried to unwind the causes-and-effects chain. The immediate cause – BPM is not a first-class citizen at business education. 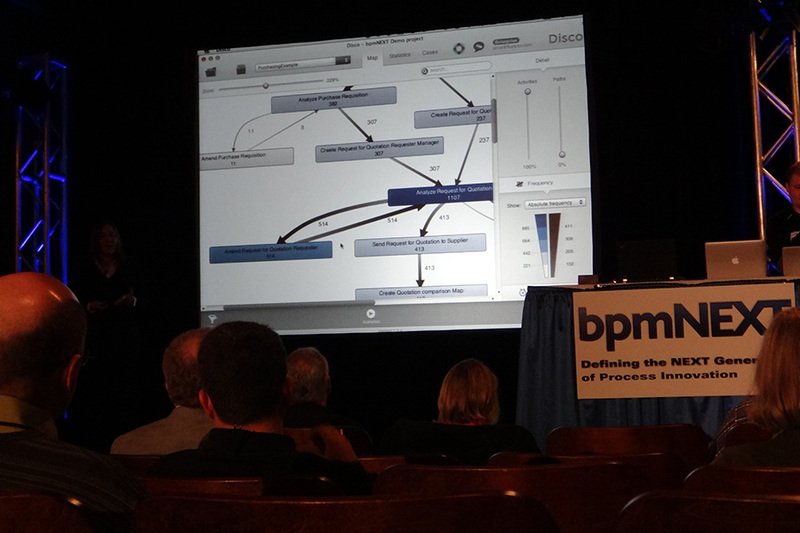 This raises another question: is BPM magic or science? Paul answered that it’s a science indeed because he personally is able to produce sustainable results. But with all my respect, it can be an indication of magic as well. If it was science, a range of practitioners with adequate education would be able to achieve the results or improve results achieved before him/her. 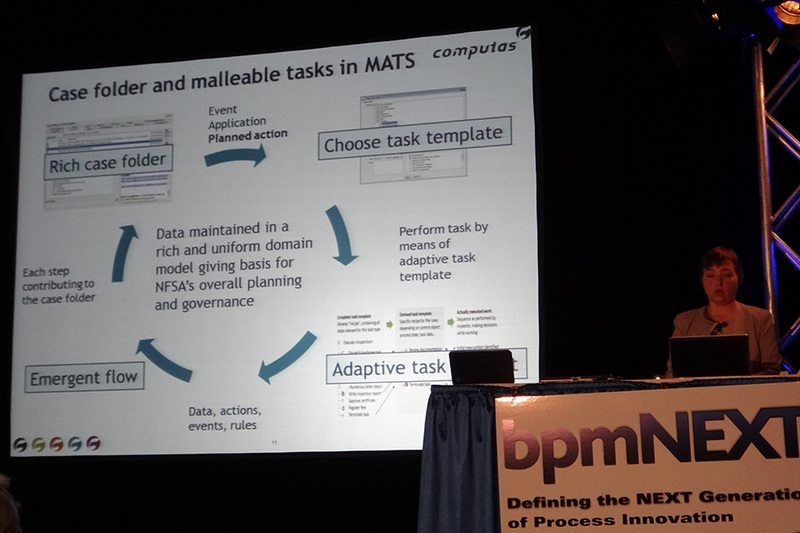 Did we reach such interchangeability of BPM practitioners? I seriously doubt. The moment of truth is when a prospective customer says: “OK, it was very interesting. Now where can I read about it?” As Denis Gagne pointed out in a private conversation, each of us can recommend several books but all of them would teach BPM differently. Again, if it was science, we could say: “Look, here are three books – pick any of them, they are basically the same.” Unfortunately we aren’t there yet. 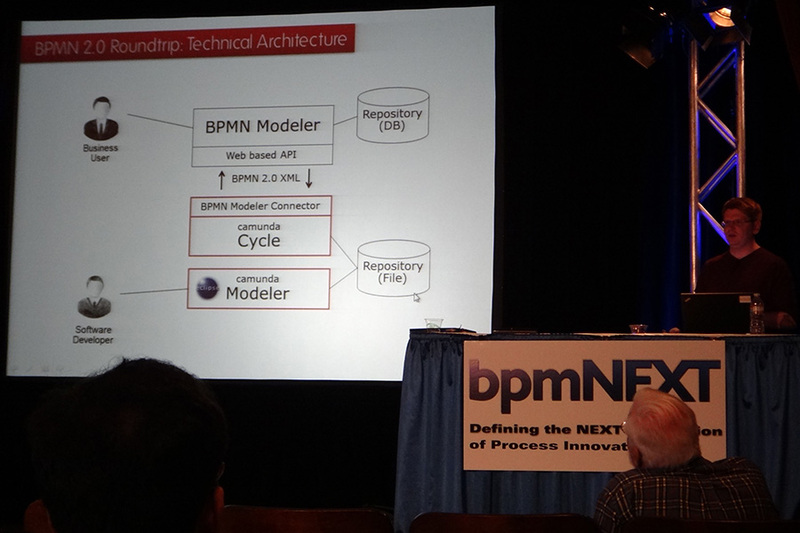 BPM is still a very interesting matter for those involved and this is the problem. It should be dull and boring to become a mainstream! May be we are too impatient? Because BPM adoption speed doesn’t match our expectations we add more features and component or even redefine it by naming “i-Something” starting from today. It’s like adding more bells and whistles in attempt to attract public to circus. 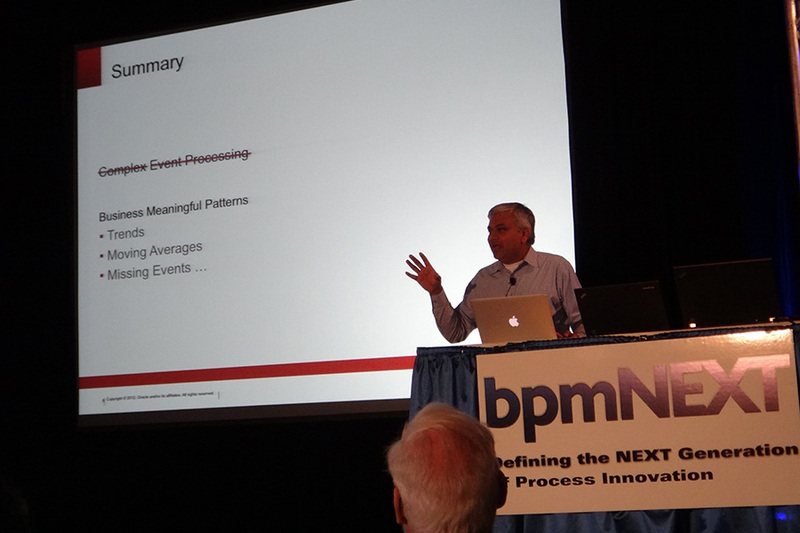 At no surprise, BPM is not just too complicated – even worse, it’s a moving target. The only way to deal with this problem that I can imagine is to develop and actively promote a Body of Knowledge covering a core set of BPM methods and technologies. Something not too broad, not too advanced, not revised too often (hence better printed than wiki). Nothing close to a bleeding edge, definitely. 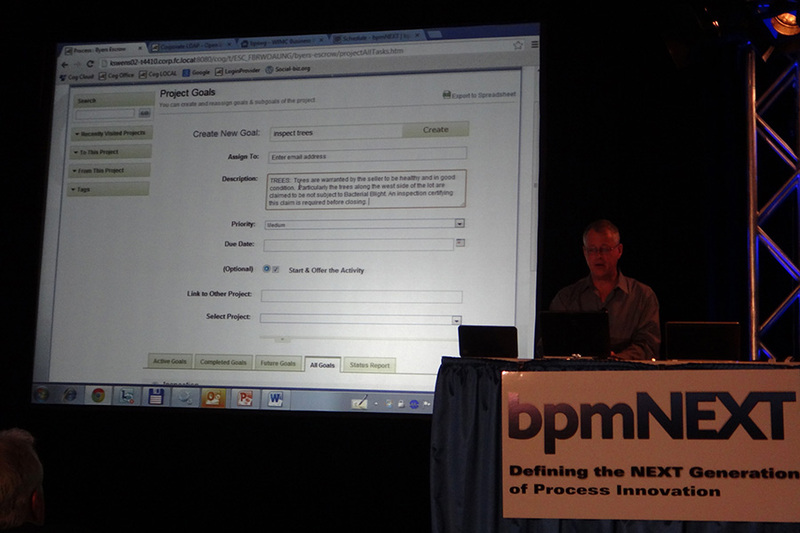 This is the way to send prospective customers a message that BPM is mature, safe and predictable. And this is basically what ABPMP does, I believe. Well, I’ve got too far from Paul Harmon’s presentation. 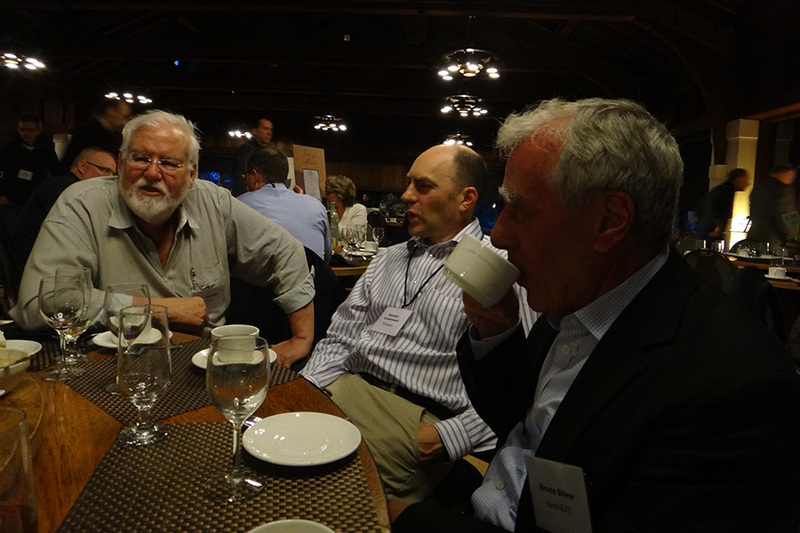 Getting back to the conference, the first day comprised Bruce Silver’s foreword, Paul Harmon’s key presentation followed by Q&A session and discussion that continued at the dinner. 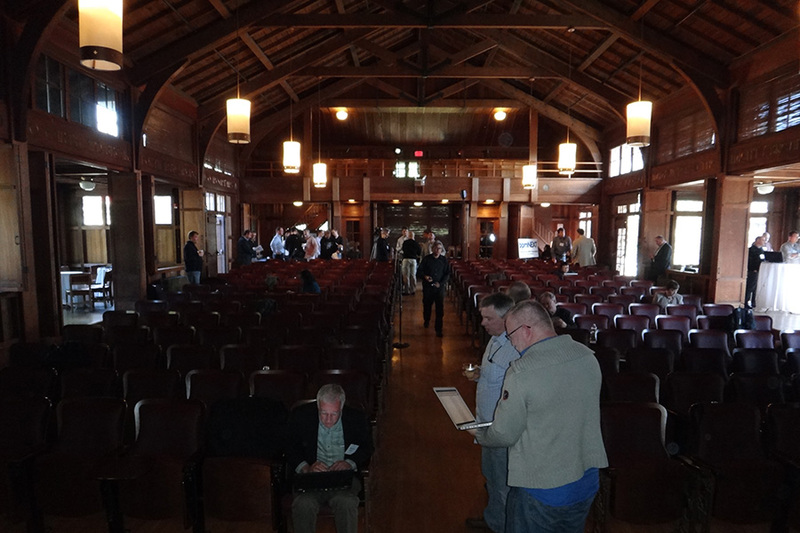 The remaining two days (March 20 and 21, 2013) were tightly packed with 24 presentations and live demos. It’d be OK if some of them could be ignored as it happens at most conferences. But not this time. Not all presentations were equally valuable for me personally but all were very interesting. The following is by no means a full coverage, it’s rather a collection of teasers or bookmarks for further reading. The selection is personal – the best from the best from personal point of view. 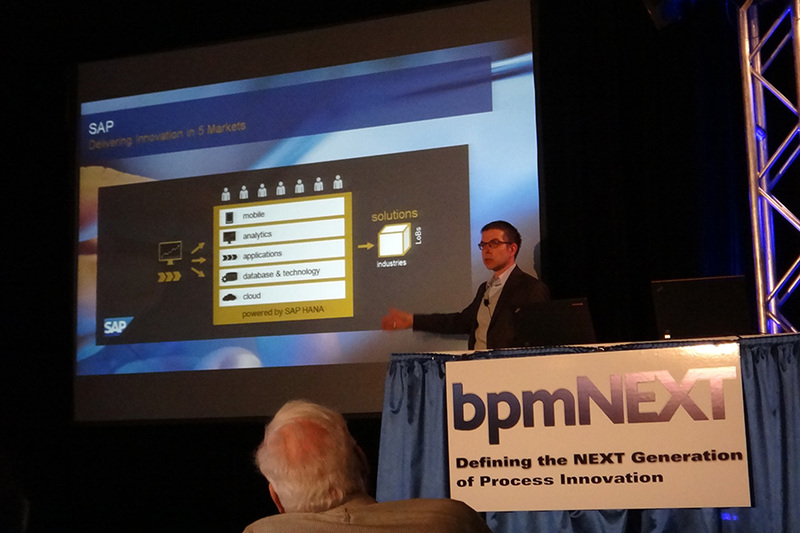 All presentations and video are promised to be available at bpmnext.com so you’ll be able to get your own opinion. “Process Mining” by Anne Rozinat and Christian Gunther, Fluxicon. An elegant tool presented in elegant manner – not a surprise they won “Best on Show”. The process mining is basically this: 1) Take a ERP event log as input. It must have a case id, performer and task names, task start and end timestamps. 2) Load it into the tool. 3) Enjoy intelligent graphs of process routes, delays, re-do’s and runaway cases. This is a good answer to managers saying “all our processes are implemented in the ERP.” With all dirty secrets revealed by the tool it turns out that they have very rough idea about “as-really-is” processes (not to be confused with “as-is”). 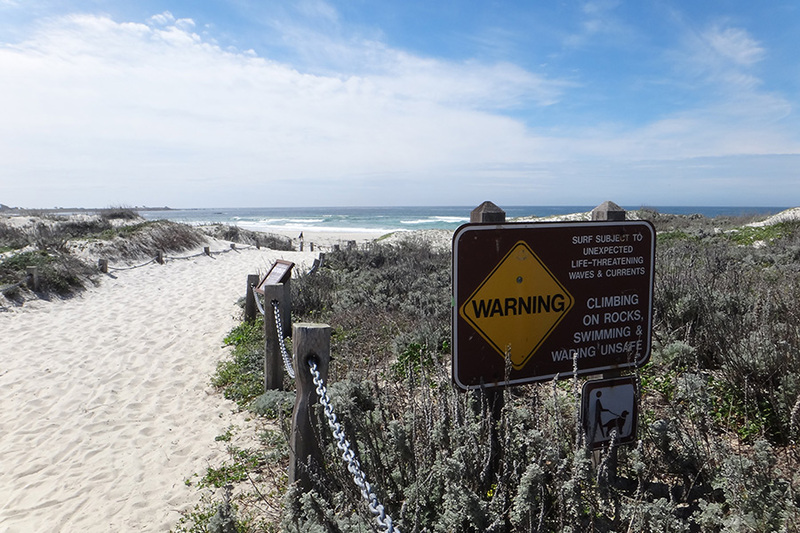 The only thing that makes me skeptical about process mining – it may be perceived as a nice addition to ERP rather as a driver to full-scale BPM effort. “Managing Process Roles and Relationships” by Roy Altman, PeopleServ. 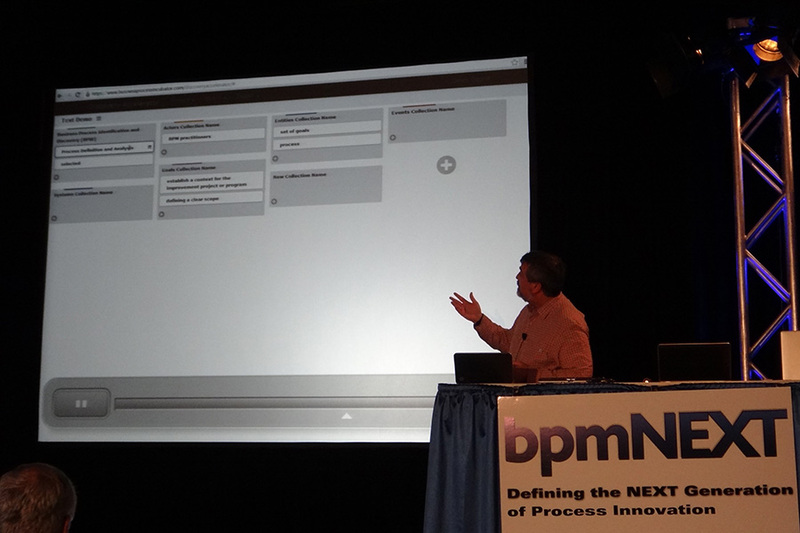 A typical BPMS-based BPM project consists of four parts: process models, data models, UI, organization structure. And the last part isn’t the least in terms of costs – it may take as much as 1/3 of total project man-hours. The major problem here is lack of standardization – there is no single truth about organization hierarchy, reporting relations, positions and roles. Roy presented a nice tool aimed on this. 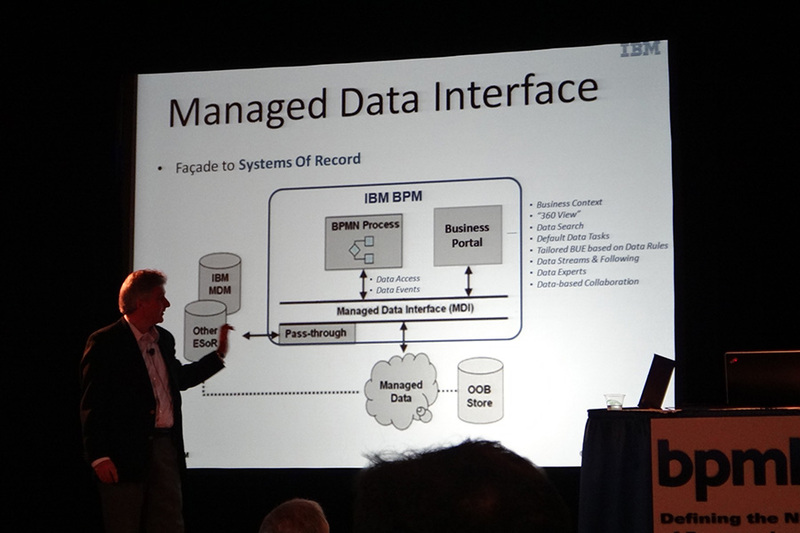 “Data-centric BPM” by John Reynolds, IBM. I blogged about “process-data marriage” and issues with the approach utilized by some BPMS vendors so I was pleased to see what IBM is working on. They introduced data-level business rules: it’s possible e.g. to declare that certain process attribute is visible only to certain users and another set of users is able to edit it. This logic is then applied to all web forms at the UI level. I believe it’s a good idea because currently this part of business logic is distributed across the UI. 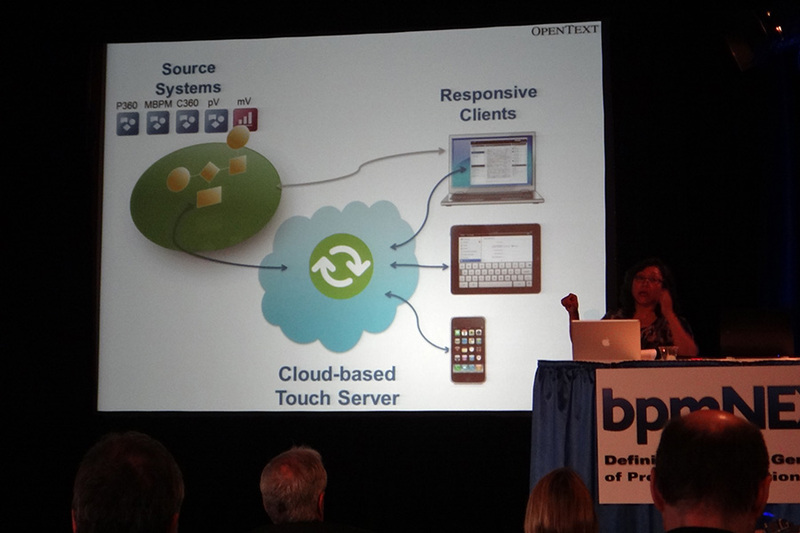 “Social and Mobile Computing for BPM and Case Management” by Rhonda Gray, OpenText. OpenText is famous for dozens of acquisitions, including Global 360, Metastorm. A number of products on hands resulted in the idea of creating a unified user interface available on any device, including mobiles indeed. And this is what they did. The product named “Touch” also features nice social functions like being able to subscribe to certain case or person much like we do in Facebook or Twitter. Rhonda’s presentation was my personal “Best on Show” choice because unified task management is my biggest dream. Every now and then prospective BPMS users say: “What, another portal?” And this is valid concern because they already have ERP, CRM and other off-the-shelf apps each with its own portal and now come BPMS, ACM, ECM and who knows what else… All these tools implement some kind of a personal tasks list but each in its own peculiar way. So the idea of a unified “personal to-do list” is obvious; however it isn’t implemented so far. The popularity of social functionality gives this idea another chance and OpenText comes close to make it reality. I only wish they widened the scope from integrating they own products to developing an open standard/protocol/tool able e.g. to get tasks from ERP and CRM suites. 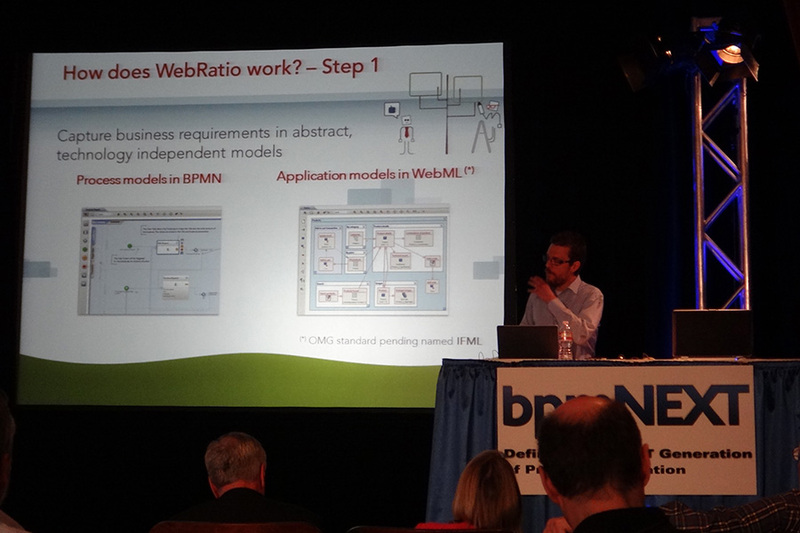 “Model-Driven Generation of Social BPM Applications” by Emanuele Molteni, Webratio. Webratio develops and promotes WebML – a XML markup language for web applications design. 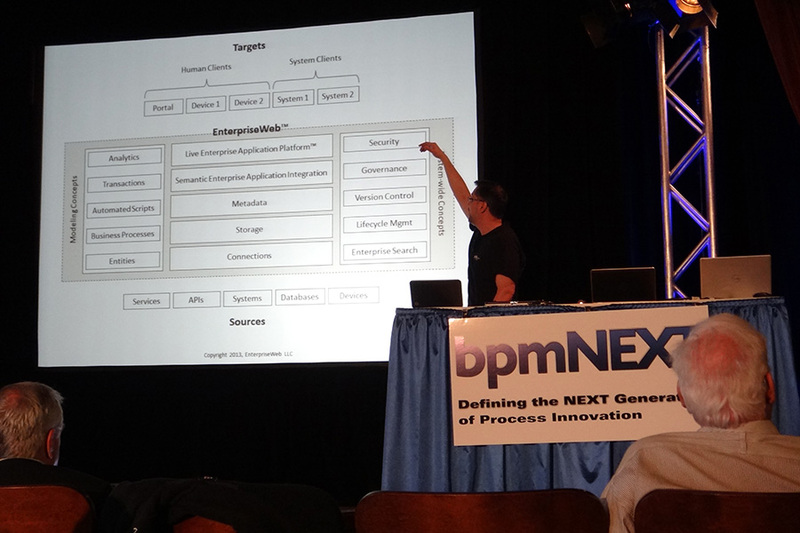 Strictly speaking, it’s not about BPM, BPM is just one possible applications. Anyway the approach is interesting and the interest doubled with the news that it’s on the way to standardization within OMG by the name IFML (Interaction Flow Modeling Language). Will keep an eye on this. “Social Process in the Cloud with Facebook” by Joel Garcia, TidalWave. The mind-breaking presentation. The old school programmers wrote code that only used OS system calls. High-level languages were based on utility libraries, ending in Java and .NET frameworks. Then internet browsers become a kind of OS for web applications. And now Facebook becomes an operating environment! 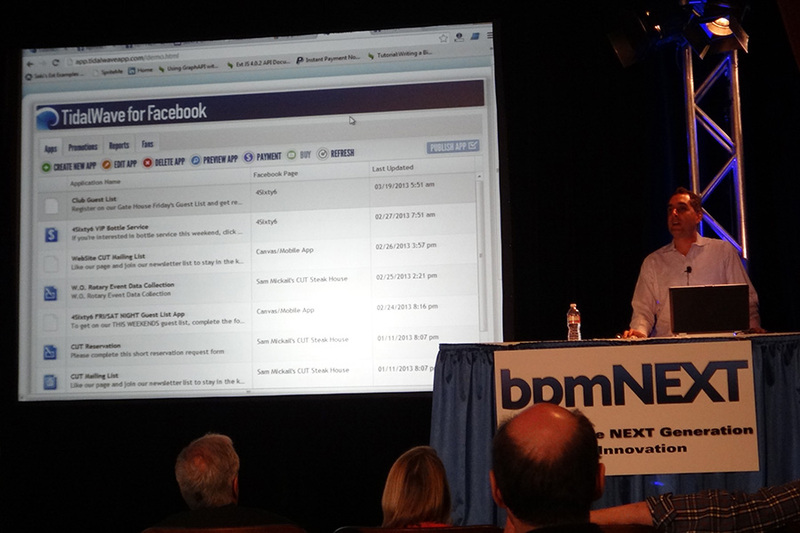 Joel showed how a BPM application is deployed for production as a Facebook application. “Goals in the Process Continuum” by Dominic Greenwood, Whitestein. The second winner of the “Best on Show” contest. Whitestein was a kind of a “dark horse” – they were mentioned in the unfamous Gartner’s iBPMS MQ but little else was known. Now I know that they do have innovative things – Whitestein has developed a notation to depict a hierarchy of process goals that adds another dimension to process modeling. In fact, it’s not just for processes – it can be utilized for case management, too. “Performing Collection of Activities as Mans to Business Ends” by Denis Gagne, Trisotech. A vague title yet very clear content. Trisotech is the company behind the Business Process Incubator project. 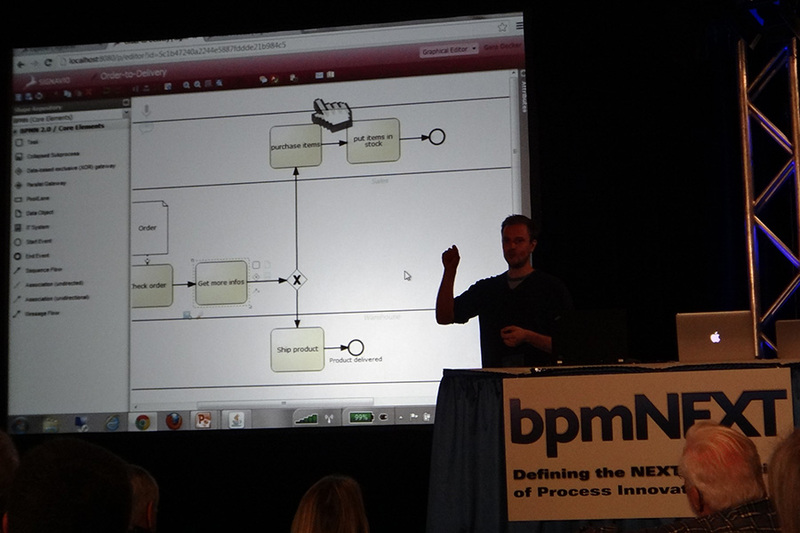 I perceived it as a (yet another) BPMN modeler but it turned out to be much more. Firstly, Denis has demonstrated an impressive web tool for gathering process information during initial analysis phase. Secondly, thanks to him I became aware that there is CMMN (Case Management Modeling Notation) draft already published by OMG – the tool supports this notation as well as BPMN. “Antifragile Systems for Innovation and Learning Organization” by Keith Swenson, Fujitsu. The third “Best on Show” winner. The presentation started with a philosophical part: what antifragility is and how it differs from robustness (robustness means remaining the same despite external impacts, antifragility relates to “if it doesn’t kill you, it makes you stronger”). It was entertaining, but the cool part was what followed – the live demonstration of the ACM tool. Although it’s in beta, it looked quite polished. The only thing I missed was the ability to transform a task not only to a sub-case (this is what Keith demonstrated) but also to a strictly-defined process. I’m convinced that there should be unified BPM+ACM tool, not two separate ones, because processes and cases use to call each other and morph into each other. It may seem that the event was too technology-oriented. 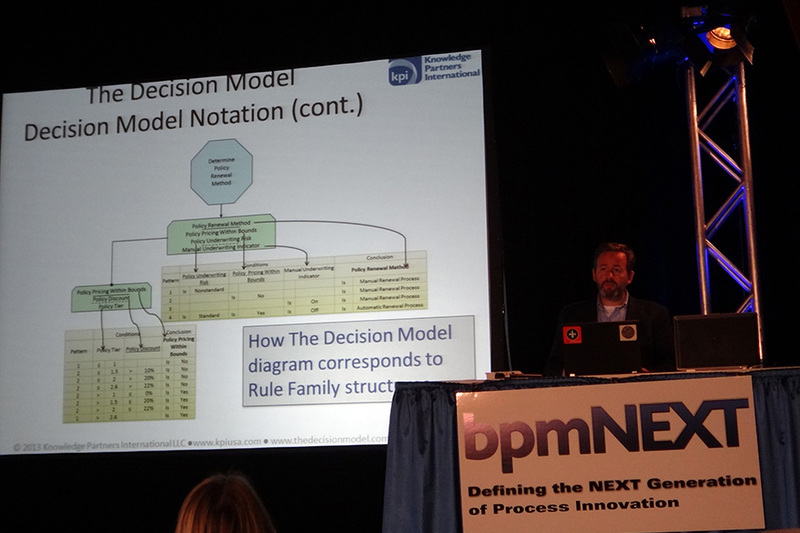 Technically it was because methodological aspects of BPM were discussed very briefly except in Paul Harmon’s presentation. But it was predefined by the format – the whole event was about the newest and coolest tools. Yet I didn’t feel disappointed as it happens too often at typical BPM conference when someone pushes “BPMS without BPM” approach. Not this time because all presenters were knowledgeable in methodology, too. 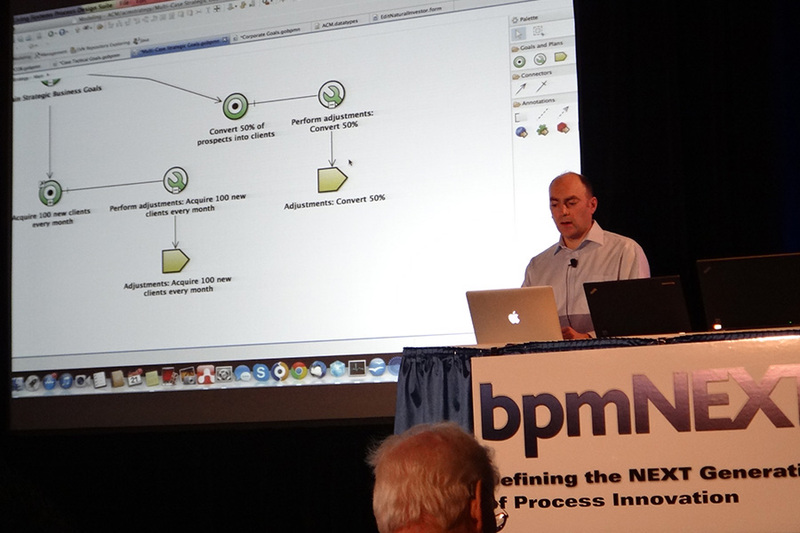 One could get an impression from my coverage that BPMN wasn’t presented. Wrong: probably half of presentations either focused on BPMN or mentioned it. 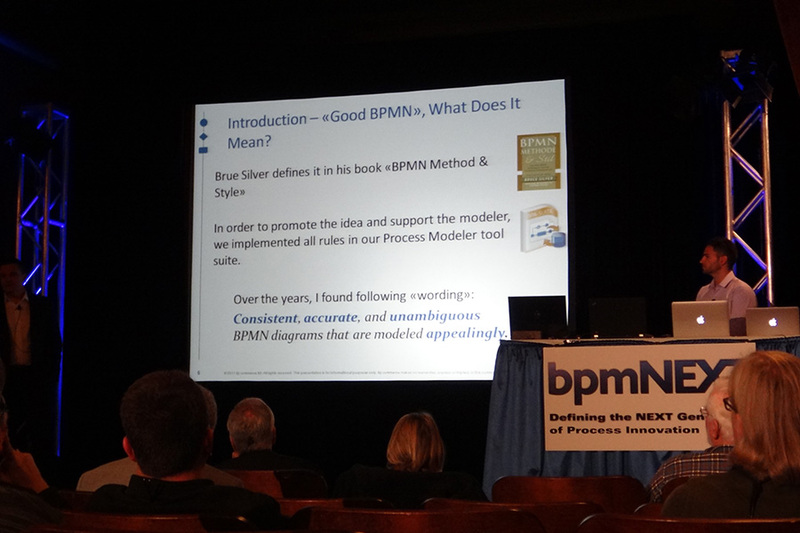 But BPMN isn’t cool any more, it goes without questions. 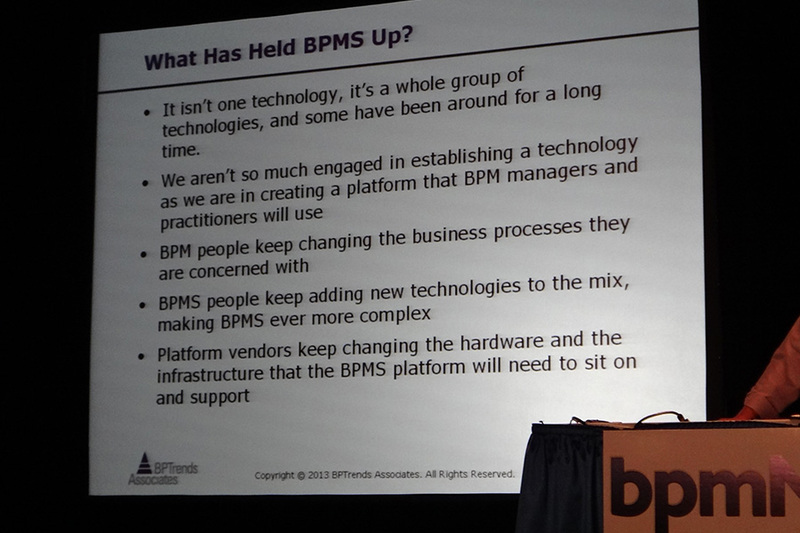 Which is good: as I mentioned above, BPM needs more boring things to become mainstream. 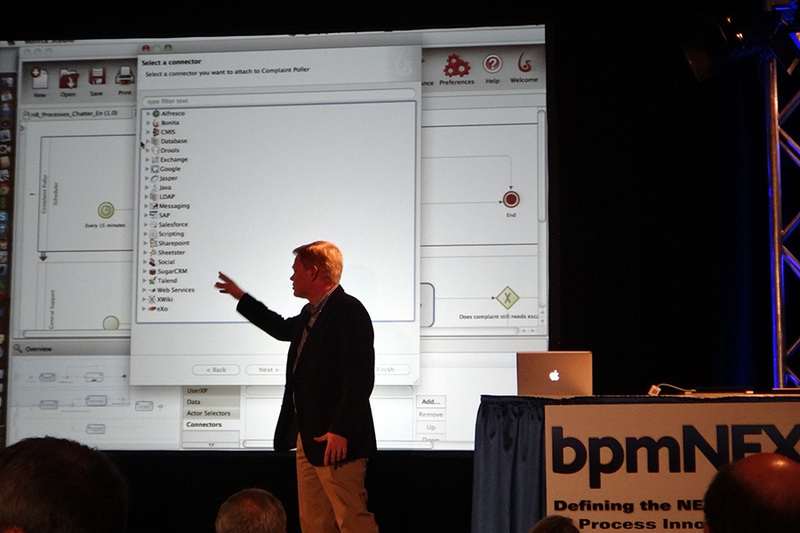 All modern BPM technology trends were presented: mobile, social, ACM, clouds. 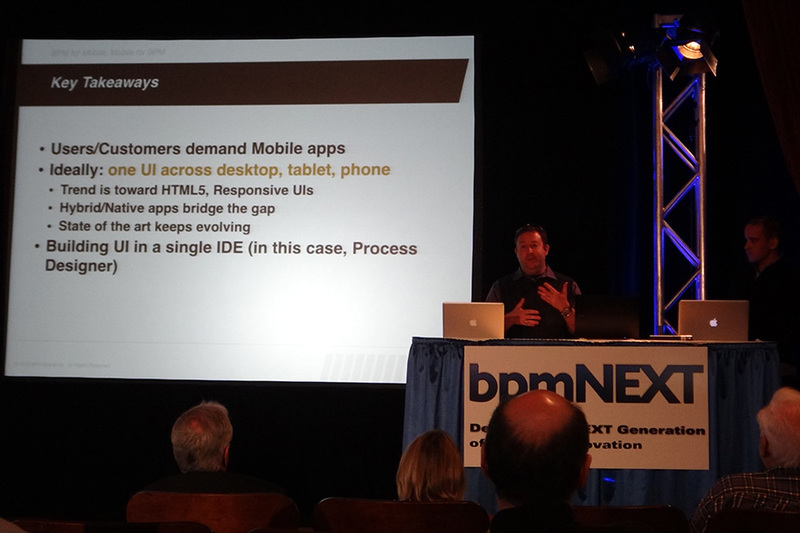 Mobile and cloud are the most mature; they can be positioned as “NEXT” this year, but probably not at bpmNEXT’2014. Social and ACM are slightly behind, there are still challenging. I was glad to see the efforts towards integrated process and data modeling. As for unified task management and holistic organization modeling, they are at experimental stage. The only trendy topic totally missing was gamification. Could be a nice addition to social functionality. May be next year. Another - more important - social dimension of the event was a unique opportunities to “attach faces to names”. Most participants knew each other for years as fellow bloggers and it was great to shake hands and to have “a glass of coffee” together. Once again, thanks to all who came for awesome company and sorry to those who couldn’t.